A memo sent to the Southern Claims Commission in regard to the claim of Thomas Gattis. Using information acquired from the captured Confederate Archives, several "loyal" Confederate citizens were found to have signed a petition asking for protection by Confederate forces. In several files of claimants from Chatham County, this was used as evidence of disloyalty to the Union. Thomas Gattis (Chatham Co., North Carolina) claim, no. 20391. Barred and Disallowed Case Files, Southern Claims Commission, 1871-1880. Records of the House of Representatives, Record Group 233. 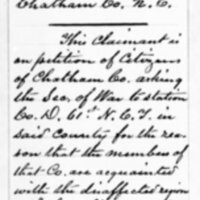 National Archives and Records Administration, Washington, D.C.
"This claimant is on petition of citizens of Chatham Co. asking the Sec. of War to station Co. D. 61st N.C.I. in said county for the reason that the members are acquainted with the disaffected regions and 'while this Co. was with us the True and Loyal of the citizens had nothing to fear." Archive Office, Memo of Archive Office, 1875, Disallowed Claim of Thomas Gattis, Civil War Era NC, accessed April 24, 2019, https://cwnc.omeka.chass.ncsu.edu/items/show/760.